Savvy Sheep: Weekly Snippet: Too Much of a Good Thing? 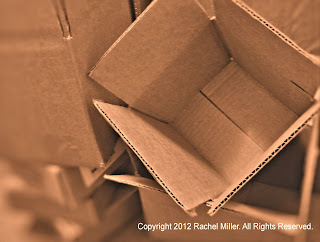 Earlier this week, I barked my shin on a pile of boxes I have stacked up in my house for my business, and I caught myself complaining to God about them. "Help me get rid of some of these boxes. I have too many!" I said. I guess I wasn't expecting an answer, but God gave it. "Two years ago," He reminded me, "You were always asking me for more, because you needed them for shipping and you didn't have enough in the right dimensions. Now you're complaining about having too much of what you asked for?" I felt a bit sheepish then (no pun intended, folks), and withdrew the complaint. Later on, I caught myself starting to complain about a similar thing--having so much food that I was worried that some of it was going to spoil. That really made me think. I'm truly blessed if I can say, today, that I have too much of something I need--too much food, too much time on my hands, too much togetherness with loved ones, too many boxes. Of course, it is possible to have too many health problems, too many needs, and too many concerns. I'm not talking about that. I just have to reflect on my complaining and say that it's really stupid to whine about having too much of a good thing, especially if that "too much" is actually an answer to prayer. Why is it that truly blessed people sometimes forget to be grateful? Those who whine about having too much of a harvest might regret their complaints if the winter comes and they didn't have enough, after all. Those who complain about having too much time with their children will always regret it when they've moved away. Of course, when we have too much of a blessing, it can seem like a curse, as long as we forget to recognize where all this abundance came from. The problem here is perception. We read about the Israelites, and how they continuously complained about everything they received from the Lord while they journeyed through the desert. In one incident, they worried they might starve, but later whined because they'd had too much manna, and were sick of eating the same thing every day (Numbers 11: 4-6). They forgot what it was like to be hungry, and they took their blessing (and their Benefactor) for granted. That's just embarrassing! The lesson we should gather is that God expects grattitude from us--a grateful heart and a pleasant attitude. He wants to see us knee deep in blessings, and thankful for it, not complaining about something that He gave us to meet our needs. This takes a special kind of faith that looks beyond things to see the glory of the Provider behind them. Every blessing, every prayer answered, testifies to the love and attentiveness of the God of the universe, because, "my God will meet all your needs, according to the riches of His glory in Christ Jesus," (Philippians 4: 19 NIV). Now does that thought make us want to complain about what we have? P.S. If we have too much, maybe we should store up what we've been given (2 Kings 4: 1-7), or share our blessings with someone else who needs them (Acts 2: 44-47). Just a thought. I think part of the problem is that we want blessings designed our way rather than recognizing that God's ways are higher than our ways, and His thoughts higher than our thoughts (Isaiah 55:9). From our flawed perspective, we see the difficulties and forget the overall blessing--for instance, we beg God to help us get a college education, but then we bellyache about all the homework. As you've said, having this "grattitude" is about putting our focus on Him rather than on the blessings from His hands.